"It's the Pebble Beach of firearms training," boasts the mastermind behind the pioneering project, Dr. Ignatius Piazza. "I felt there was a need for a world class facility, done much like the golf resort industry. The people living in Front Sight will have an expertise in the use of firearms that is far superior to the police force. This is not about building a Waco compound for gun nuts. We are building a world class resort centred around the safe and responsible use of firearms and to provide a level of training that is better than that given to any law enforcement in this country. The people who take our classes and are interested are honest, law abiding citizens. What we are giving them is similar to what you find in a high-end golf resort." Front Sight will be able to house about 600 people as full time residents. Another 550 can rent townhomes while doing gun courses there and 40 staff will man the community. "I am building Front Sight because it is needed. Interest is growing at 300% per year in gun self-defence. Gun control has never worked and it never will. Gun control actually increases violent crime because it shifts the balance of power into the hands of the criminals. Recent scientific studies have proven that concealed weapons in the hands of law abiding citizens prevent 2.5 million murders, assaults and rapes per year in the US." To the European mind, a utopian society built upon the premise of guns is anathema. But this is not London, Paris or Vienna. This is America, a land sick of violent crime on their streets and in their schools. Front sight is nestled in the Nevada desert, 50 miles from the glittering casinos of Las Vegas and several miles from the nearest highway. Piazza is a member of the powerful gun lobby the National Rifle Association, but insists he is not affiliated to any militia group. Most of the students attending his classes are police officers, housewives and professionals. With 70 million gun owners in the US and 222 million registered guns, the demand is there. About 9 million of gunowners have incomes higher than $100,000 a year. "This is strictly high end. The model we're basing this on is a high-end golf resort," said former chiropractor Piazza, 39 "We are in no way, shape or form associated with any militia or extremists. Many of our clients are law enforcement." In fact more than 3,000 people have come to see the planned town since January. The majority of interested 'residents' are professionals: doctors, lawyers, police officers, accountants, contractors and even a retired secret service agent. "Your radical people aren't going to be involved in this," added David Dwyer, the engineer in charge of development. "The people who are the militants, the crazies up in Idaho who make $20,000 a year or less, we are not involved with them. This has national, high-end draw." The community will be incorporated as a town and receive its own post (ZIP) code. Lots are not for sale; instead, they are included as one of the benefits of the highest level of membership in the Front Sight Training Institute. They have sold 26 platinum level memberships, which cost $200,000 and include land to build on and the use of gun training facilities. The lowest level for holidaymakers, the copper level, costs $6,000 and enables the member to attend a number of firearms courses and use the pro shop and gunsmith facility in a kind of timeshare programme. 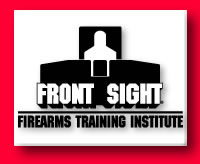 'Front Sight's' first phase, which includes training rooms and ranges will be finished by the end of the year and new residents will be welcomed by the end of 2000 Piazza is sensitive to the issue of violence particularly after the Columbine High School massacre and the Atlanta school shootings. But he is adamant that more gun ownership and better training would have stopped the attacks early on. "Firstly, these incidents have little to do with firearms. They are problems of parental supervision. The media and other outside influences have a big influence on these kids. But if teachers had been armed and properly trained we would not have seen a massacre at Littleton. Had any adults there been armed with a concealed weapon, it would not have been a six hour siege by two very disturbed individuals.. The problem would have been handled immediately. Lives would have been saved. The Israelis armed their teachers in the 70s after a spate of terrorist attacks and those attacks soon stopped. It is all about restoring the balance. Washington DC is the only place that does not allow any firearms ownership and yet they have the highest murder and violent crime rate. Gun control does not work." Piazza, 39, has been a gun fan for years, but hit on the idea of fighting back against crime with the idea of a gun-friendly 'safe-haven' after a drive by shooting. His house in the upscale suburb of Aptos, California, was raked by automatic gunfire as a car of youths sped past in a random attack. The former chiropractor became fanatical about guns and took just about every course in gun self-defence he could find. He became one of the top gun instructors in America and set up Front Sight Firearms Training Institute in Bakersfield, California in 1996, which now trains more people in the use of guns than the next competing five centres put together. Then with the cashflow from those classes his dream of the ultimate weapons utopia became a reality. 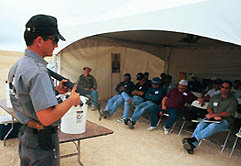 Piazza was attracted to the Nevada desert site, because of the state's "friendly firearms" laws. Nevada allows citizens to carry concealed weapons and own sub-machine guns. The local police and town hall chiefs are backing the planned project. There has been no local opposition in Nevada, which proudly sees itself as the last remaining pioneer state in the US. Donna Lamb, the Pahrump Regional Planning Commission secretary who toured the site said: "We were impressed with the magnitude of the project. And it seems pretty safe out there in the desert." Tom Riley, a member of the Pahrump County Planning Commission, added: "Our planning commissioners are in support of it. Instead of the 19th hole they have the bullet hole. I don't really understand the need for sub-machine gun training. I don't really understand the need for a five-story SWAT tower, either. And I don't understand how they're going to find 177 people to move to the middle of the desert. It strikes me as being ludicrous. I have a problem understanding that concept, but I can't find anything wrong with it from a planning perspective." But the idea of an openly gun-toting society right in the middle of America brings memories of Waco and redneck Militia compounds. "I am frightened by these isolationists and gun fanatic people who want to commune together and promote a life that focuses on guns," said Eric Gorovitz, policy director of the anti gun lobby the Bell Campaign. "They are talking about building a culture focused on guns. They will have a school with children growing up in this environment and then those kids will interact with the rest of society and that to me is scary."